An elderly man in Burbank, California was the victim of a seemingly random violent knife attack and was stabbed in the face. The suspect was stopped by a good Samaritan who physically came to the aid of the elderly victim who was in his 70s. The good Samaritan struggled with the suspect who was stabbed in the altercation. 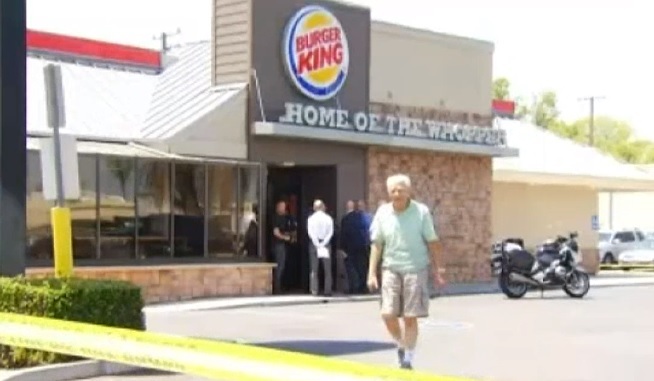 Burbank police responded to a call of an assault with a deadly weapon at a Burger King on North Victory Boulevard around 11:00 a.m. Tuesday. Police say that three men were eating lunch at a table inside the restaurant when a man came in and began stabbing one of the men in the face. A good Samaritan witnessed the violent attack and intervened resulting in the suspect being stabbed several times. The suspect was identified as 36-year-old James Rey Richard Kagaoan of Sun Valley and was taken to a nearby hospital but did not survive. Police say the victim in his 70's was also transported to the hospital and is expected to survive with nonlife-threatening injuries. The good Samaritan managed to come out of the life-threatening incident relatively unscathed and was not transported to the hospital. Investigators say the attack was not provoked but police are still investigating what could have prompted the stabbing. They also say there is no evidence that Kagaoan knew anyone at the Burger King which was filled with patrons at the time of the attack. Tips on the incident can be reported to the Burbank Police Department Investigations Division at (818) 238-3210. James Rey Richard Kagaoan - Now another DEAD Crazy Homeless person. Isn't it time to end this Liberal Experiment of releasing the violently insane and tossing a Magic pill at them ? Isn't clear it is NOT working? Isn't it time to reopen the State run Mental Wards for the Violent and criminally insane, to protect the public?